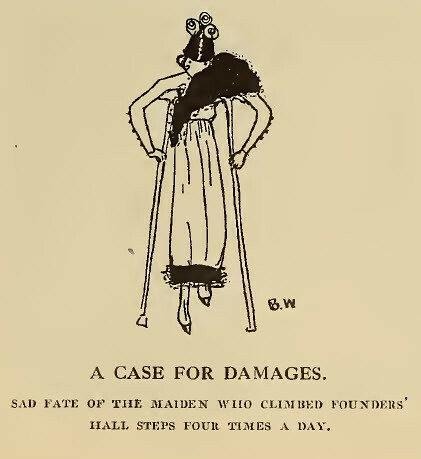 A cartoon from the Wellesley News, the student newspaper of Wellesley College, from the late 1910s. This image reminded me of Charlotte Perkins Gilman's short story, "If I Were A Man," wherein the protagonist turns into a man for a short period of time and realizes how the materials of everyday life limit her ability to move through the world. Within this image, the fact that the woman has been injured by her own shoes because of having to climb steps four times a day is a striking reminder of how something as simple as footwear differences between men and women create a difference of ability. That shoes are made for display rather than to do what they are intended (protect the foot while walking) is a curious consideration in terms of understanding the real physical limitations women have (and continued) to be subjected to.